New York City Again – It Never Gets Old! Was it Plan A, Plan B, or Plan C for our departure from Port Washington??? Monday morning brought a dreary dawn so we decided to skip Plan A and wait to see if the day might improve. By noon it was clear that Plan C was definitely a “go.” We made a quick grocery run and prepared to leave by 1:00 pm. We have made this particular passage south through the East River twice before, 2013 and 2015, but that doesn’t matter. 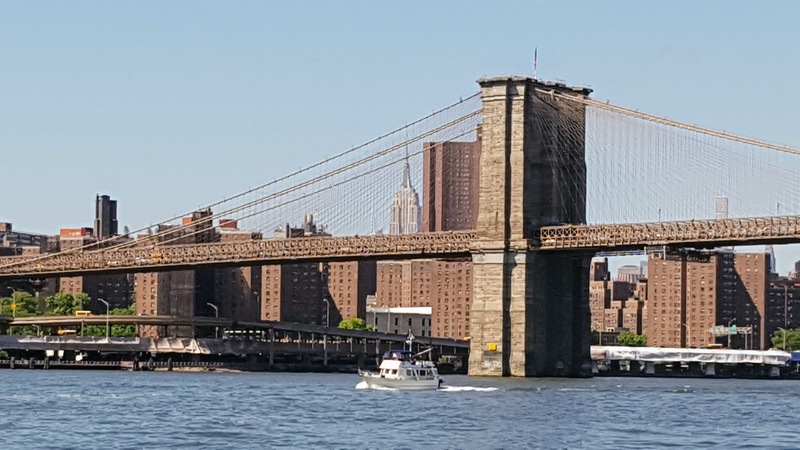 Traveling past the “Big Apple” on the East River is still one of the most exciting trips you can make by boat. 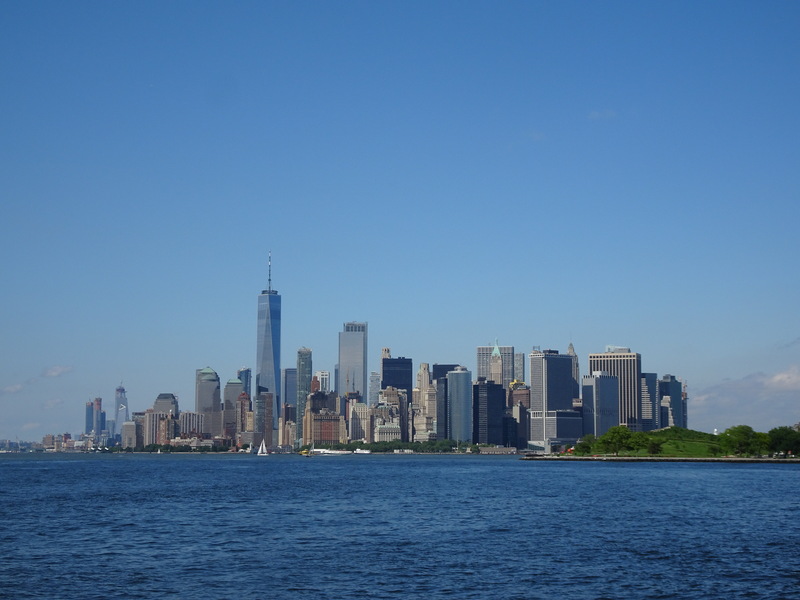 So, although I have plenty of photos from the earlier trips, I simply could not resist taking more photos of my favorite sights and adding something new. After leaving Port Washington, we always remark about the sweet red lighthouse but never knew its name. 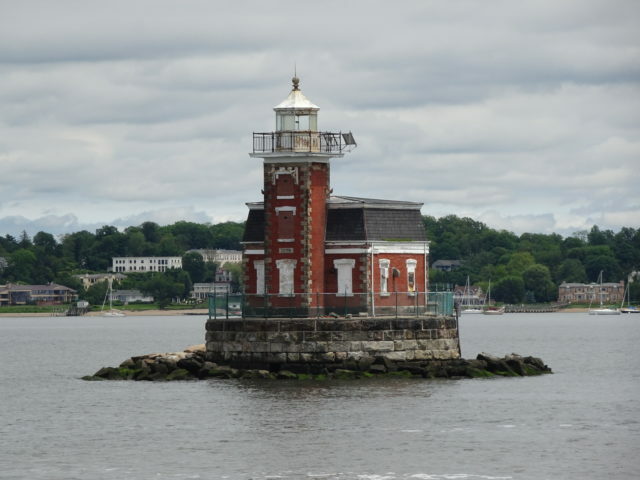 Now I do – the “Stepping Stones Lighthouse.” Built in 1876 in the Victorian Second Empire Style, it’s purpose was to warn boats of a shoal and rocks that extend into Long island Sound. Although modernized in 1944 it is now in poor condition and needs to be repaired. I hope that can be done. Stepping Stones Light house, built in 1876. The trip from Port Washington to Hell Gate has several notable landmarks, all of which I have photographed before. 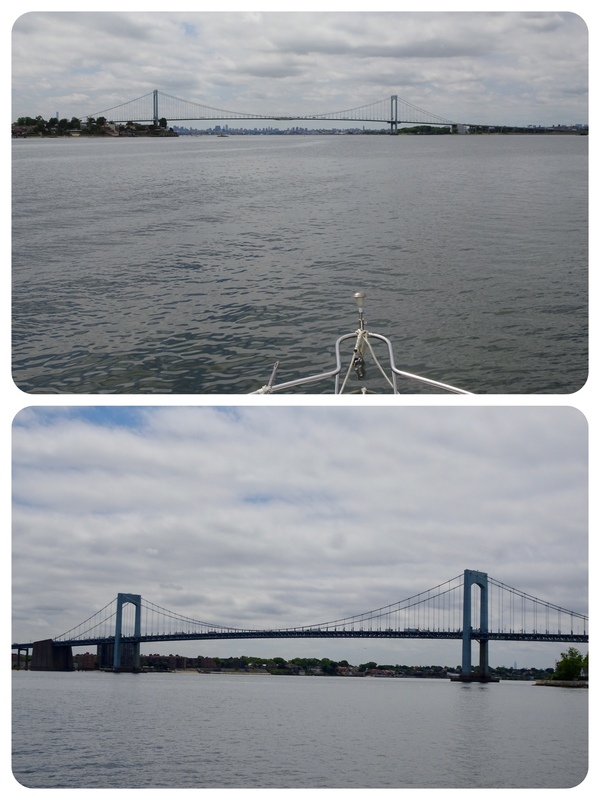 And I did it all again…..
First the Throgs Neck Bridge, 50 minutes after departure and then the Whitestone Bridge, 15 minutes later. 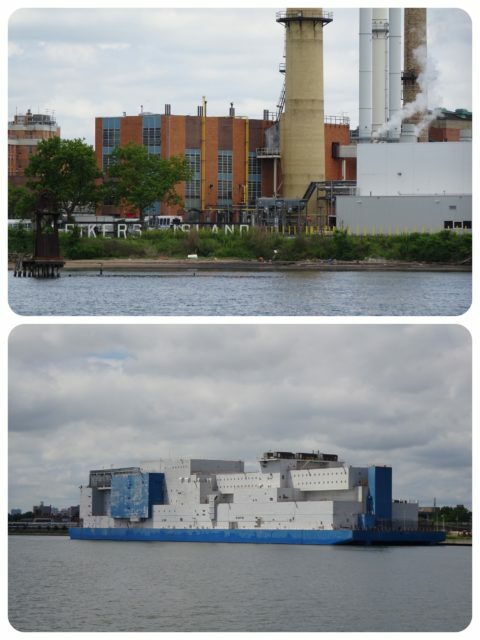 Rikers Island on port side and and the floating jail barge, “The Boat” on starboard side. A bit depressing to use prisons as landmarks on a passage, but there they were. We certainly timed our passage perfectly for “slack” at Hell Gate, exactly 3:00 pm (1 hour 45 minutes after High tide at the Battery.) No current to fight against or to assist us. 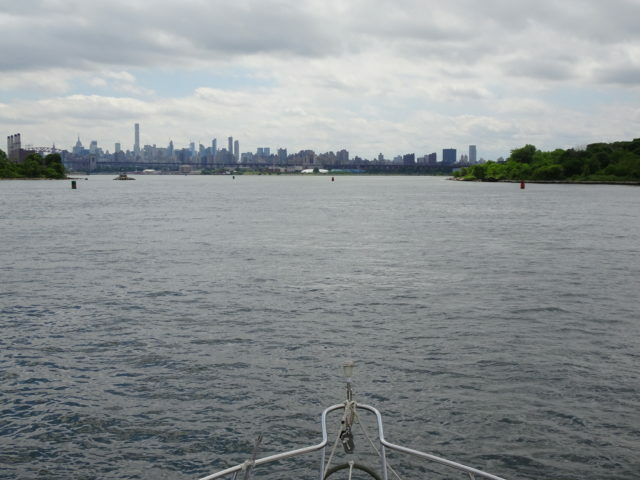 Although a very calm and uneventful trip, we did miss the thrill of riding with a strong current as we have done in the past, reaching 11-12 knots of speed! 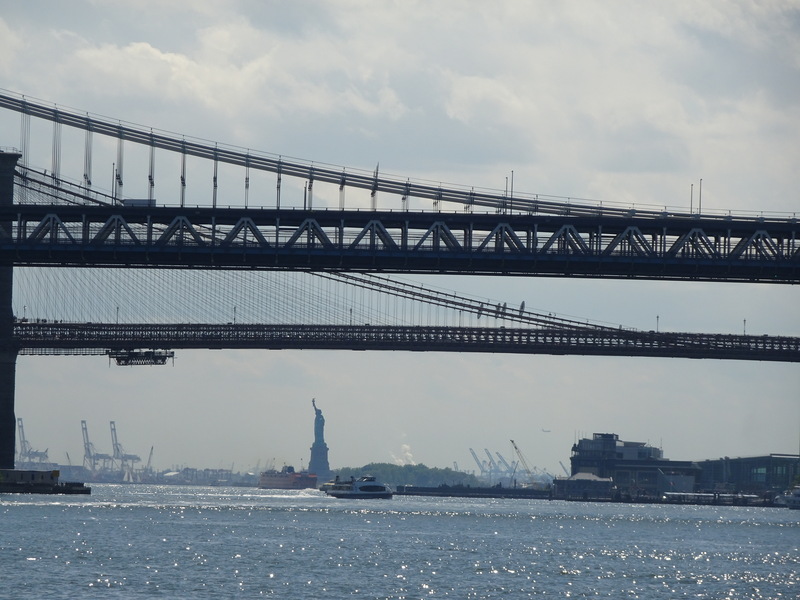 Entering Hell Gate ahead. It didn’t live up to its name, which is a good thing! 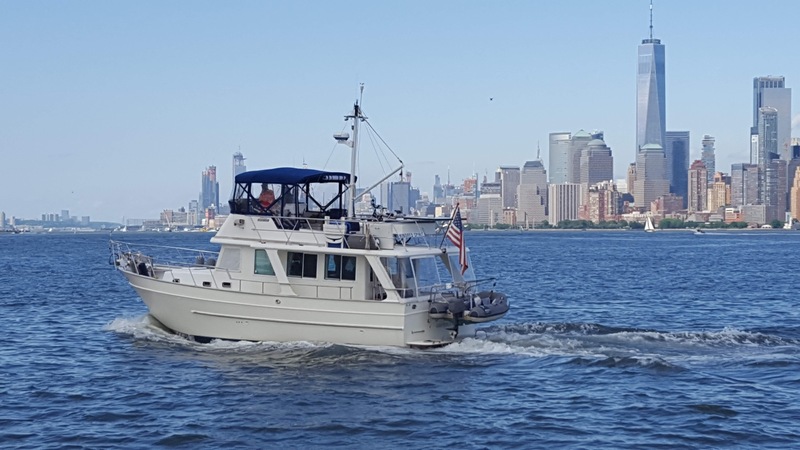 This little adventure is happening because our friends on Magnolia,who are embarking on a westward trip to the Great Lakes on their Kadie Krogen 42, asked us to join them on the Hudson River section. 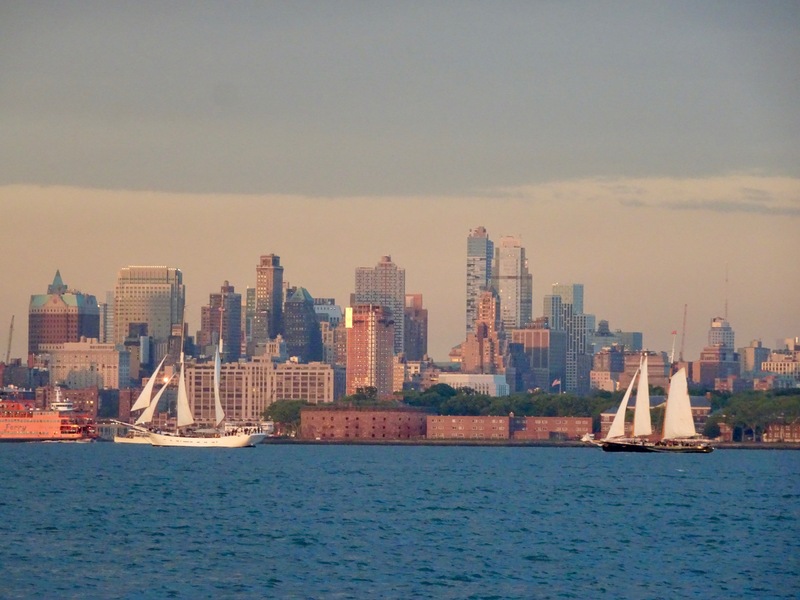 When we departed Port Washington, they departed from Staten Island. AIS positions for Kindred Spirit (upper right) and Magnolia (lower left). 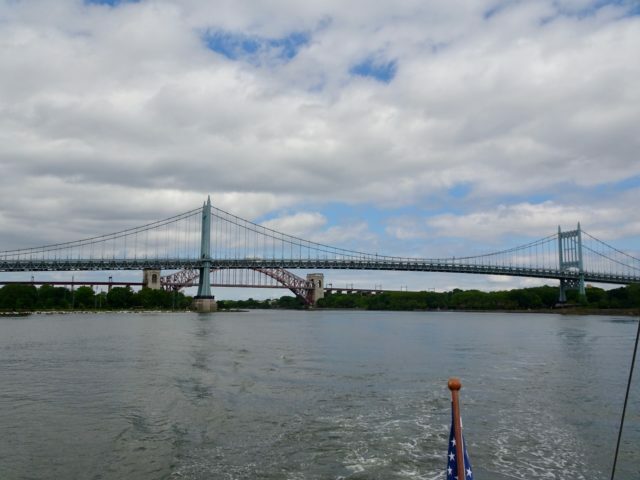 Looking back at Hell Gate – not hellish at all. I lived on the east side of Manhattan way back in 1978-1979, which adds an another element of thrill to this day. I love seeking out the places I knew. 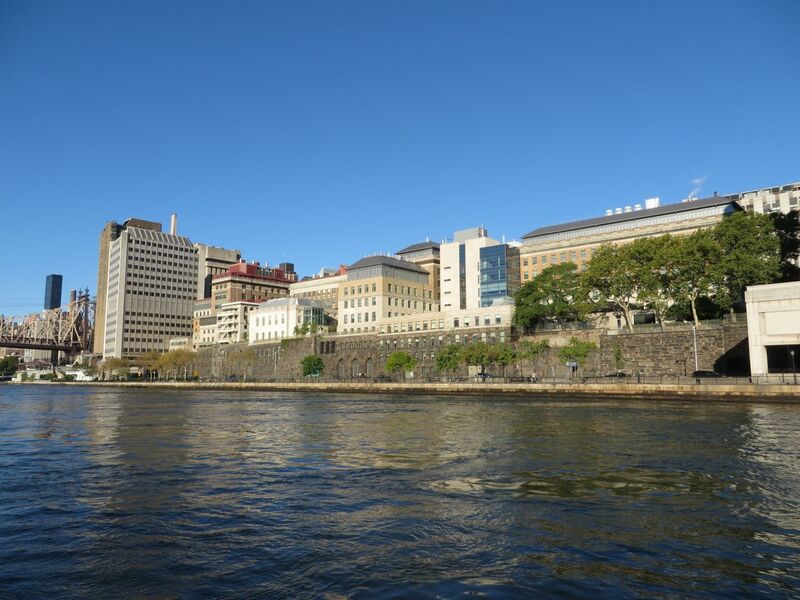 As we cruise down the East River I am always on the lookout for my first sighting of Rockefeller University, just after the hospital. 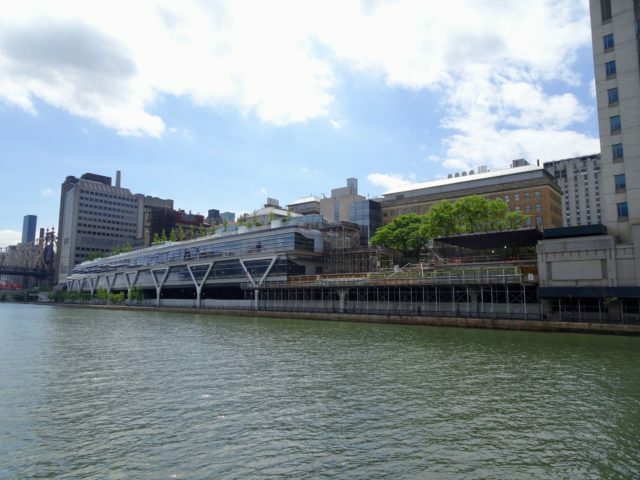 The Rockefeller University is a center for scientific research, primarily in the biological and medical sciences, and provides doctoral and postdoctoral education. 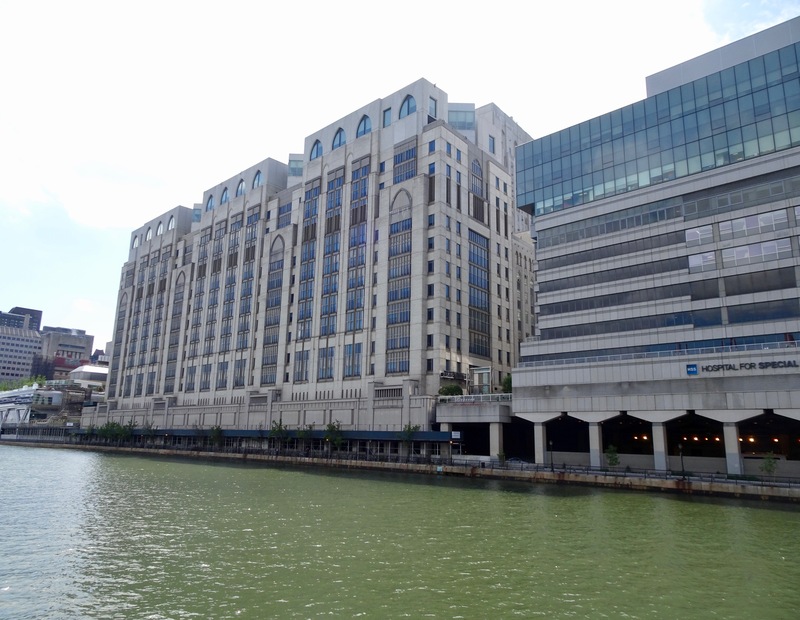 Rockefeller is the oldest biomedical research institute in the United States. I worked part-time in a neurophysiological lab for a short period before Ryan was born, while his father completed his post-doctoral work in microbiology. 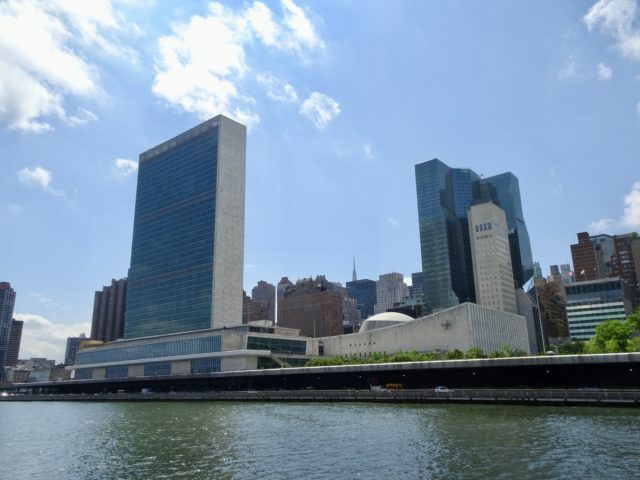 In the midst of the city concrete, Rockefeller’s campus was a tiny oasis of green. This is Rockefeller University today, under construction as it builds out over the FDR Highway. We were fortunate to live in housing provided by Rockefeller University at a nominal rental fee (for NYC). Back in the 1970s our apartment on the 6th floor had a nice view of the East River. 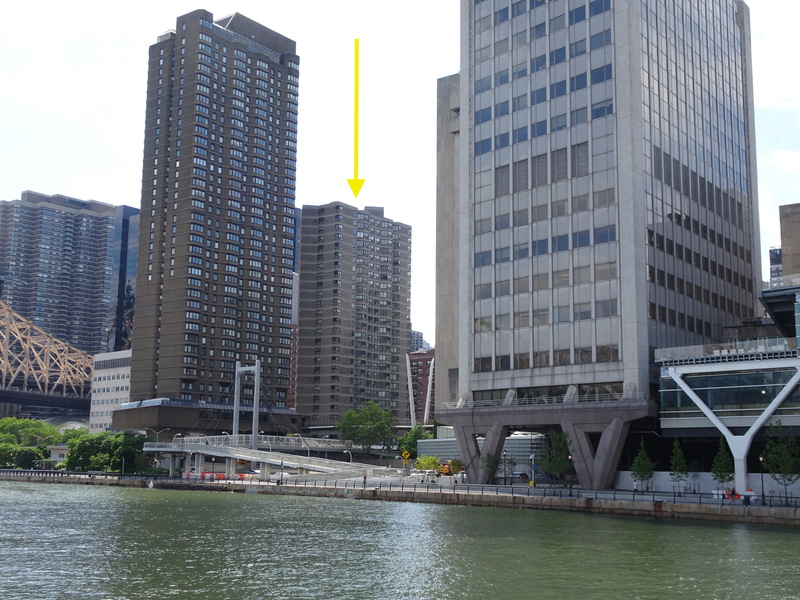 Just like on our previous trips, I am a bit disappointed to see the big high rise apartment buildings that now drwarf our building on York Avenue. 63rd and York Avenue, my old apartment. Pretty nice address for a kid in her mid-20s! 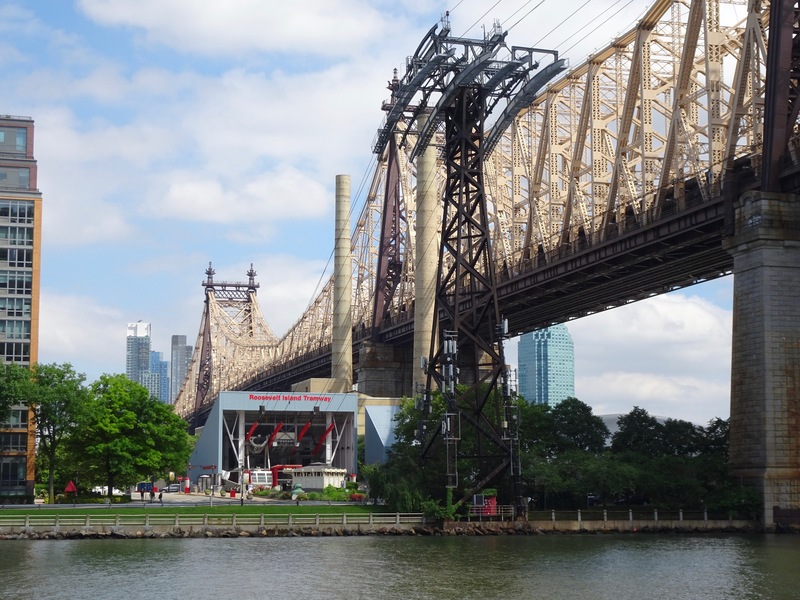 We passed under the Roosevelt Island Tramway, an aerial tramway in New York City that spans the East River and connects Roosevelt Island to the Upper East Side of Manhattan. Opened in 1976, the tramway is the first commuter aerial tramway in North America. The two capsules run back and forth on two parallel tracks. One is just barely visible in the photo. Sutton Place, a cozy, affluent and green section of the Upper East Side, spans East 59th Street south to East 53rd Street and over to First Avenue. 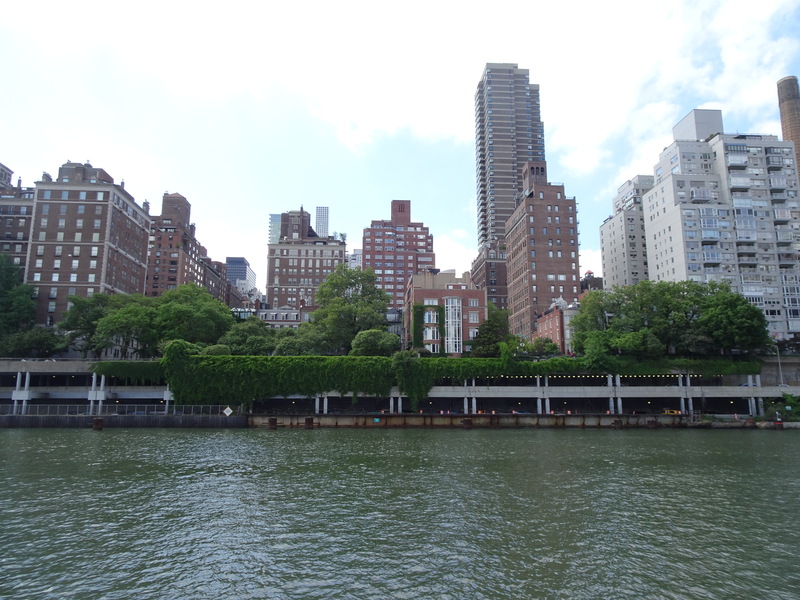 One of NYC’s affluent neighborhoods, Always searching for some green places tucked among the concrete and brick, I would often stroll through here back in the late 1970s. 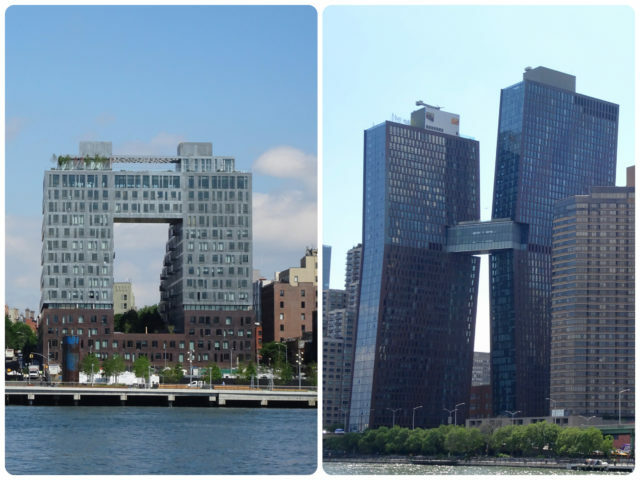 Not all city buildings are constructed as tall rectangular prisms. 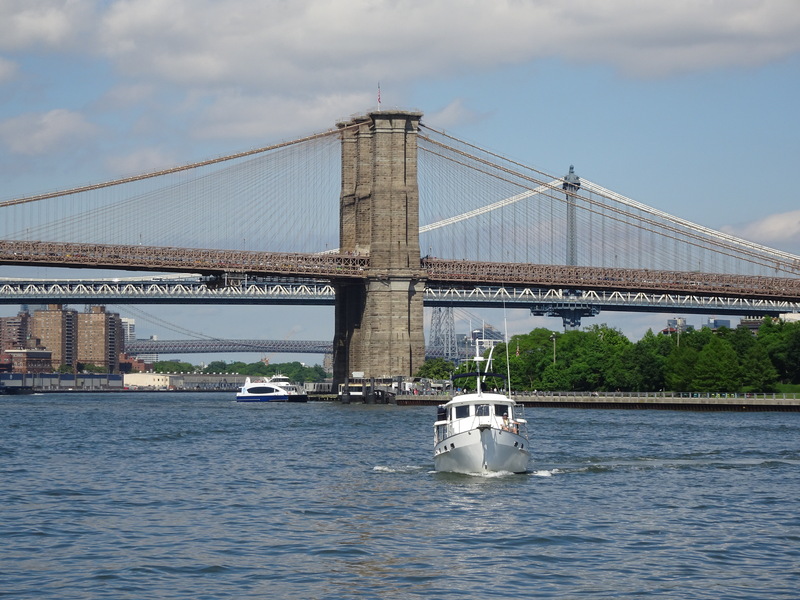 The boat traffic on the East River that afternoon was typical, but not awful. 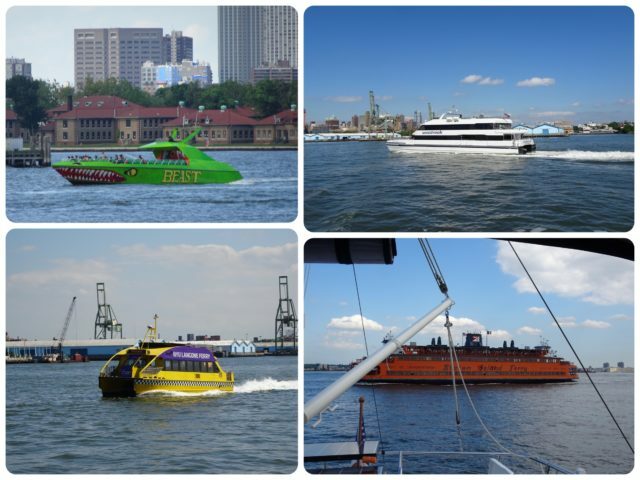 The city water vehicles are as unique as the architecture and the street scenes. Our heads twist and turn from one side to the other as they speed by. There she is – Our first sighting of The Lady. 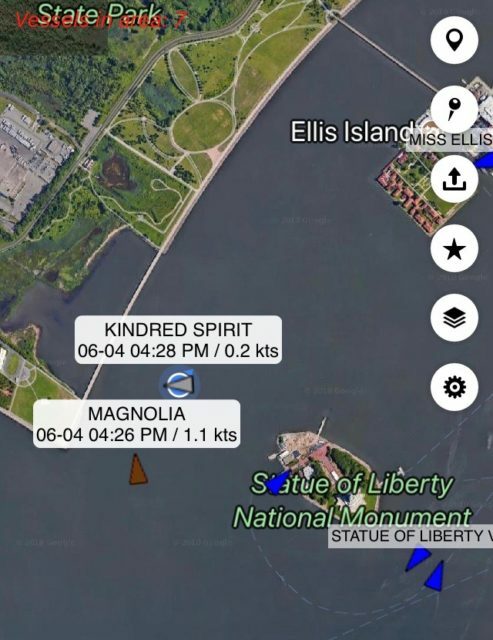 Magnolia and Kindred Spirit reached the Brooklyn Bridge at the same time!! This is where the fun really began — when you travel with a boating buddy, there are awesome photo opportunities! We both traveled down the west side of Governors Island. 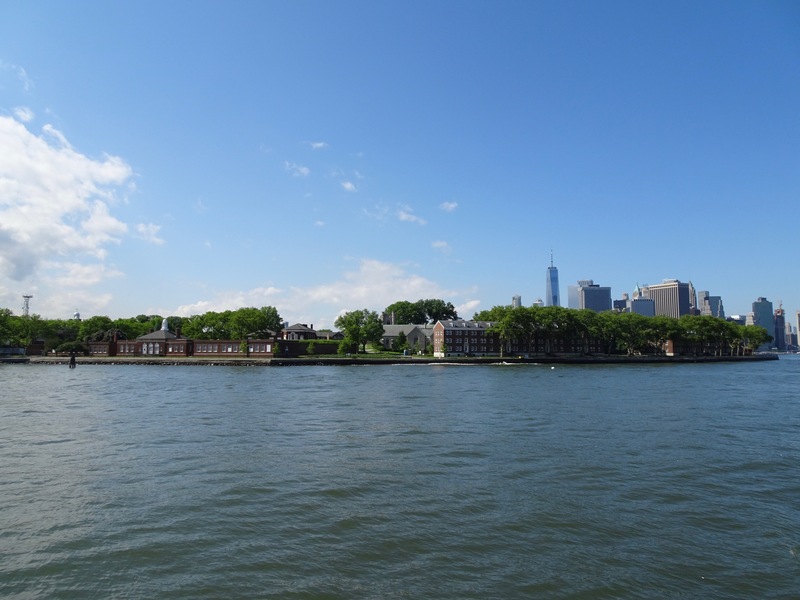 Governors Island is 800 yards from lower Manhattan and 400 yards from Brooklyn, separated by the Buttermilk Channel, which I suppose we were in at that moment. It was the first landing place in “New Netherland” for the settlers who arrived in 1624 and is considered to be the birthplace of the state of New York. 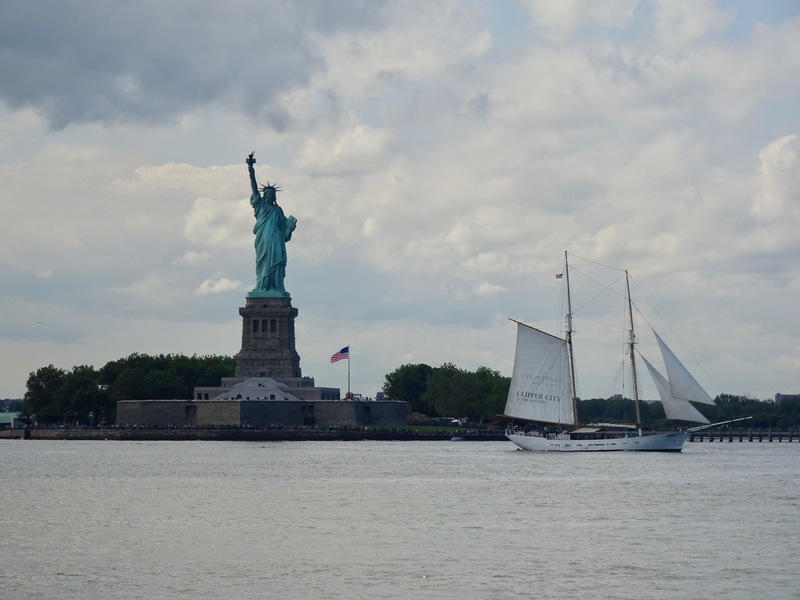 Kindred Spirit on her way to the Statue of Liberty with lower Manhattan in the background. 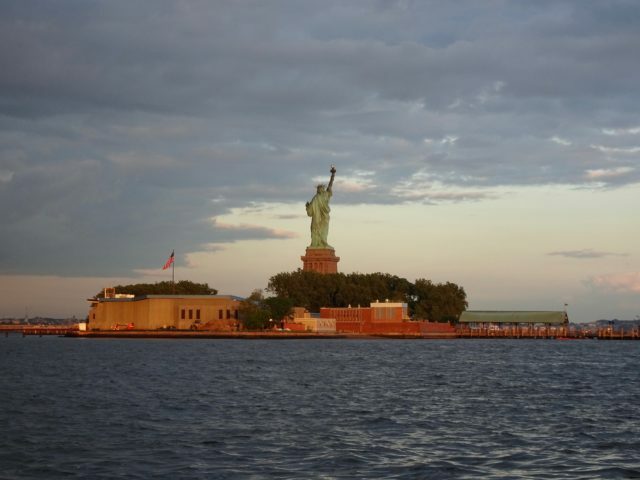 At 4:00 pm in the afternoon, the sun was behind the Statue of Liberty, but she is beautiful in any light. 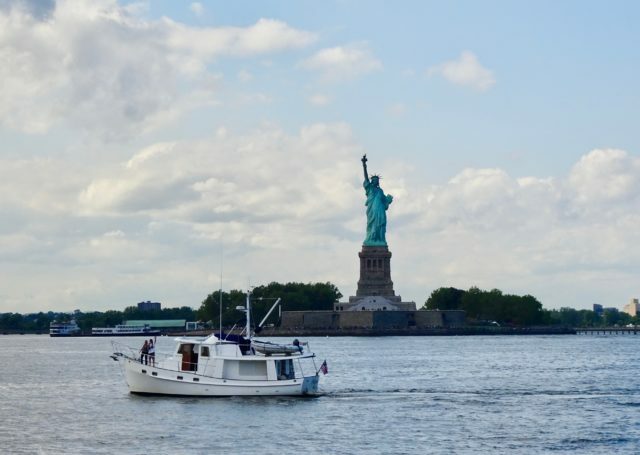 We have passed by Lady Liberty four times, going south and going north, but this is the first time we ever anchored behind Liberty Island. 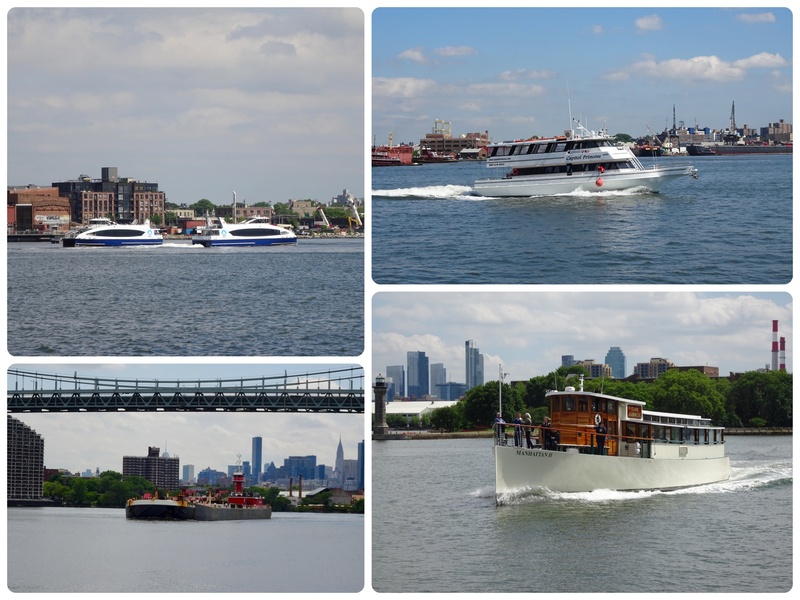 The anchorage is very, very rolly from all the passing ferries and river traffic. 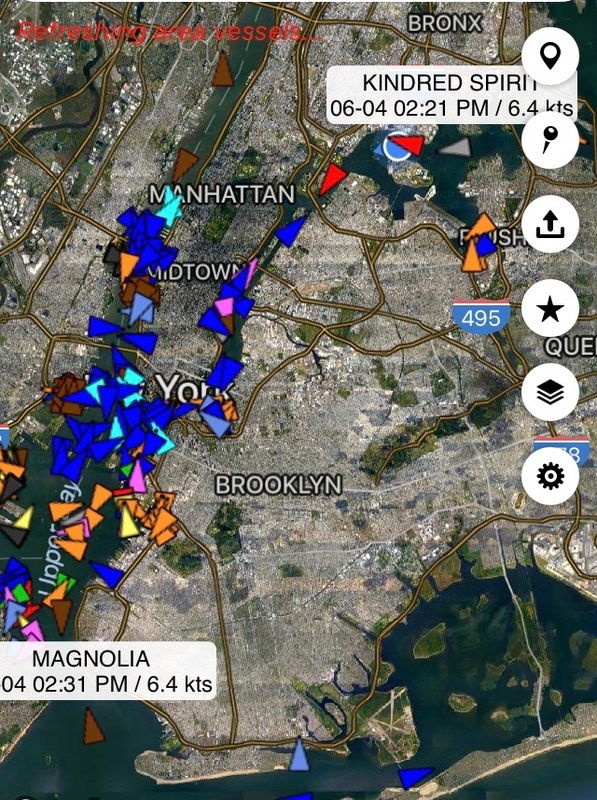 AIS shows our positions in the anchorage, between Liberty State Park in Jersey City, NJ and the Statue of Liberty. 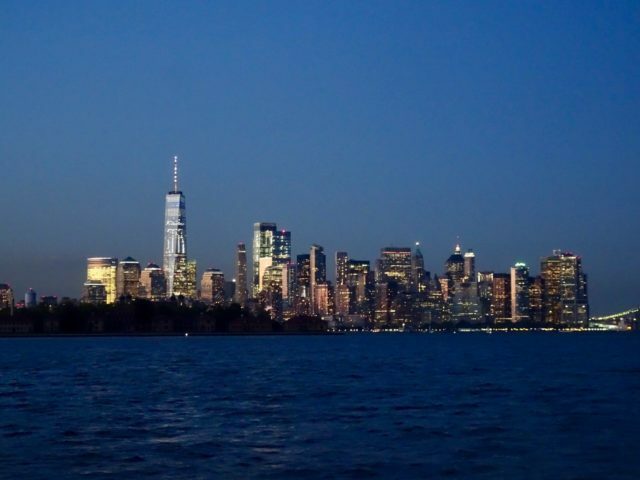 The setting sun and night sky provided a beautiful show for us. 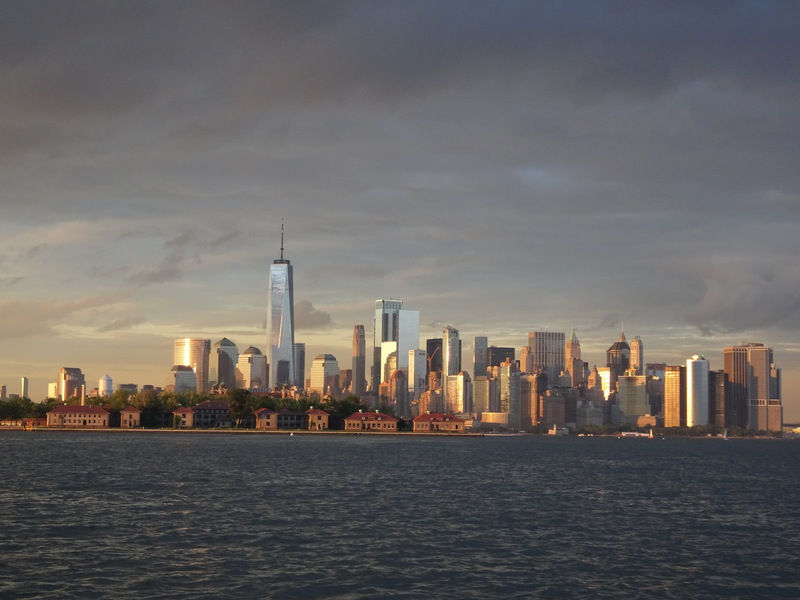 By 8:00 pm Manhattan is glowing in the setting sun. 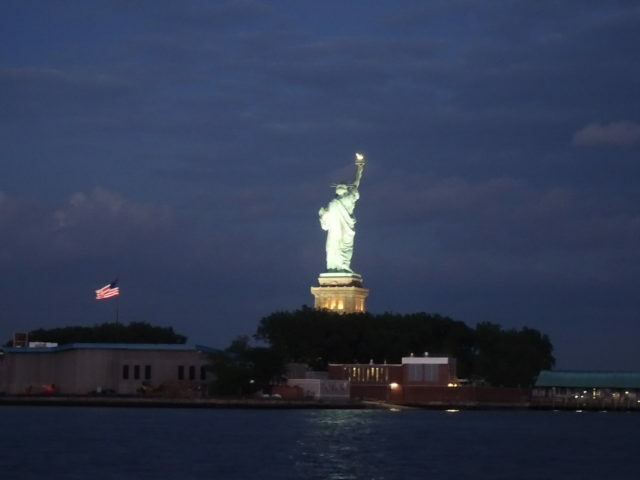 She is inspiring even at night, her arm raised high and our flag flying beside her..